Friday and Saturday, December 7-8 at 7 p.m. The Messiah performance of the year! Nearly 200 amazing musicians and powerful voices bring this choral masterpiece to life with the return of Aram Demirjian as guest conductor. 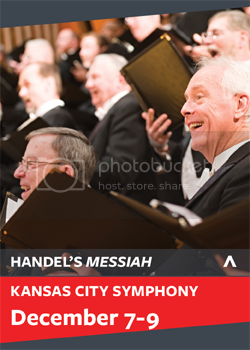 From the “Passion of the Christ” to the “Hallelujah Chorus,” Handel's glorious Messiah is bigger and better than ever in the acoustically marvelous Helzberg Hall at the Kauffman Center - an unforgettable start to your holiday season.